So thinking I opened the bundle and to my surprise the first book which I saw was Satcharitra, not only that I found Baba's photo which I had kept long time back exactly on the 15th chapter which I was supposed to reàd for Mahaparayan on 1st Jan. 2019. This proved that Baba had full consent and immediately at midnight of 31st Dec. itself I read that chapter. What Baba expects from us is full devotion and that is what I am earnestly begging Baba. No feelings or thoughts or intentions are ever hidden from our Deva. He the master of all, knows exactly what we think and do. His timings are also perfect for all things. He knows all the contents of our life's book. 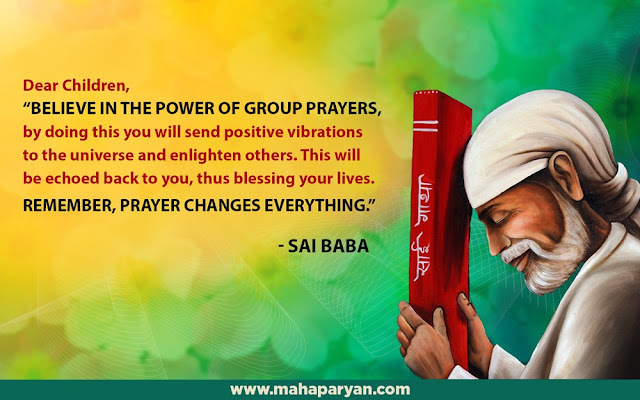 So let us go through it with the guidance and blessings of our Teacher Sai. With such a Guru we will never fail in our exam called life. We can only surrender to His supreme power, Will and existence and thank Him for choosing us for Mahaparayan. Love You Deva, Jai JAi Ho Sai...!